As much as he is known for his boxing skills, once can just not oversee Tyson Fury’s antics. The British heavyweight, who made his comeback to the ring after two-and-a-half-years, was at it again. Just seconds before his bout against Sefer Seferi of Albania in Manchester on Saturday night, Fury appeared to have kissed (yes, you read that right) before winking as the referee gave final instructions to both fighters. Fury, a former unified champion, went on to toy around with Seferi before the latter retired on his stool at the end of fourth round. Twitter users were clearly not impressed with the self-styled Gypsy King’s capers. “I love @Tyson_Fury but any more kissing and hugging and that would have been 18+ viewing only,” one user wrote. 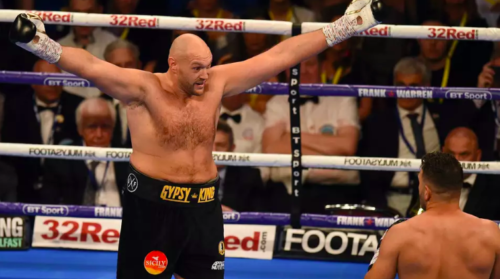 “Well that Tyson Fury fight was a waste of time, kissing his opponent, taunting him, doing silly dance, talking to the crowd, fight kicks off in the crowd,” another wrote. Meanwhile, elsewhere around the globe, Terence Crawford became a three-weight world champion by stopping Jeff Horn in the ninth round of their fight for the WBO welterweight title. Jermell Charlo, too, continued his unbeaten streak, knocking down Austin Trout before clinching a majority decision win to retain his WBC super welterweight belt. Leo Santa Cruz defended his WBA Super featherweight and won the WBC Diamond featherweight belts following a unanimous decision win over Abner Mares.